I forgot to say it the other day: Happy New Year! We rang it in at home, kids in bed, sipping champagne and talking about our goals for the year to come. Did you do anything exciting? The company that was scheduled to come out this weekend had to cancel, no thanks to freezing rain... and the threat of a high of -31C on Sunday to 'balance' things out. We will reschedule with them, and as disappointing as it was to miss out on a planned visit, I'm feeling SO relaxed right now. My house is really-super-duper-pre-company-CLEAN, I've gotten the laundry caught up on, meals are planned for the weekend, and snacks are made. I have nothing to do except experiment with some more quinoa-flake banana muffin recipes (I tried two this morning - these were really good), play on my Pinterest and catch up on some reading and crafting. Ooh, and prep school work for next week, that too. I think I may need to schedule time into my year that is like this: scheduled time to NOT have a plan. I think it would be good for my health and sanity. I have a recipe for you! It's one of my most-requested recipes, and while I had it on my old blog, I thought it was time to bring it over. We were introduced to this salad in 2012, when my aunt brought it to a family function, and everyone fell in love with it! 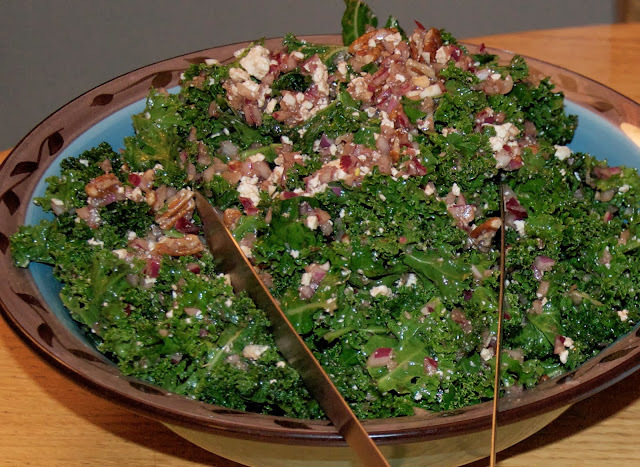 This is the ultimate Kale Salad recipe, and one we've been making often - at least weekly - for the last year and a half. My kids gobble it up and ask for seconds, and we all love the lemony, garlicky flavour and the kale's crunch. I am also thrilled with the fact that because it calls for raw kale, it will keep in the fridge (IF you manage to have any leftovers), and stay crunchy for the next day. Why should you eat kale? Because it is a super-food! It's packed with HEAPS of Vitamins A and C, loads of iron and zinc and fiber, and other vitamins, minerals, anti-inflamatory and anti-cancer nutrients. You can go here for more. Basically, I'm really happy when my family eats a lot of kale. It's easy to customize this recipe for people who aren't doing dairy (goat feta or no feta), and you can make the pecans optional. The dressing and kale alone are enough to make us all very happy. Combine dressing ingredients. Add kale, garlic and red onions to dressing. Using your (washed) hands, mix and massage the greens, so that the greens are well coated with the dressing. Allow the flavours to mingle for 20 minutes before serving, for best results. Add the pecans and feta just before serving.